Demo board used by Blue Planet NL Team Rider. 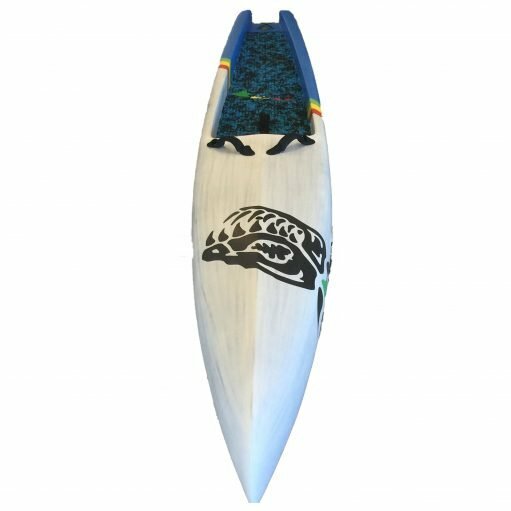 The Dug Out Race Series boards are designed with a single purpose in mind: To be uncompromisingly fast at the lowest energy intensity possible. This board comes with a FREE Blue Planet boardbag according to your board’s specific dimensions! As the name suggests, the deck has been carved out, lowering your centre of gravity vis-a-vis the waterline and improving your blade angle which leads to a higher board speed while minimizing the energy spent. The outline, rocker line, hull and rail shape have been tweaked to suit the type of racing. The Dug Out Racer is the pure-bred flat water race board, designed for long distance racing in protected waters. It has a sharp piercing nose, straight outline, limited rocker line and sharp rails to let you benefit from as much waterline as possible and glide effortlessly. The Dug Out All Water designs have a wider and more voliminous yet piercing nose, a curvier outline, more rocker and softer rails designed to let you excel in Open Water Racing, i.e. Downwinders and Technical Races.